Read through the key Bible passages on spiritual gifts and you will discover that spiritual gifts are not age-based. There are no exemption clauses apart from being a true Christian. Every believer has at least one spiritual gift but in young believers, such as children, these gifts are not always evidenced or developed because of where they are in their life experience. If given a spiritual gifts test, for many the results will be inconclusive. That, however, does not mean that they do not possess gifts. What it does mean, is that they need our help to see who they are in Christ and to help them identify and develop that which He has given to them. We need to provide them with the tools to discover their spiritual gifts and a means to mature in the use of their gifts. You may want to implement the following ideas before considering the use of a spiritual gifts test with children since their experience-base is so limited. 1) Provide teaching about spiritual gifts and God's design for the church. Help young people to understand God's purposes for the church and for their lives which include serving in His church. Help them realize that they have a part to do right now, not just when they are older. 2) Provide opportunities for children to serve. Children need to develop a base of experience in ministry so they can begin to identify how they may be gifted. Encourage them to get involved in a variety of ways. Offer a consistent diet of ministry opportunities. Involve them, as you can, in the various aspects of total church life where they can work side by side with adults. Suggest that families serve together as teams. God will use these opportunities to grow passions within their hearts and to surface and develop their spiritual gifts. 3) Provide children with affirmation and feedback. When Jesus sent out his disciples to minister, He took the time to discuss how it went with them. Why would we do any less with the children and youth whom we deploy into ministry of any kind? First, they should be included in training opportunities. Second, they should be affirmed in what they are doing. If there seems to be an area in which they do particularly well, tell them. Third, provide feedback afterward. Evaluate with them what happened, both the positive and the negative. Offer suggestions on how they might improve. Or, if they just don't seem to be suited for a particular type of ministry, help them find something that may be a better fit. 4) Provide these young believers with role models. Adults ought to be setting a good example for the kids. So many adults, however, do not do their part. This can send a strong message to them contradicting all your verbal teaching about why they should get involved. If you expect young people to get it, you better work at making sure the adults get it. Develop a prayer base for the children and youth of your church that goes beyond praying for only the troubled ones. Pray also for those who seem to be doing well and who want to be a part. They need to be empowered by the Holy Spirit in whatever they do for Him just as much as an adult does. 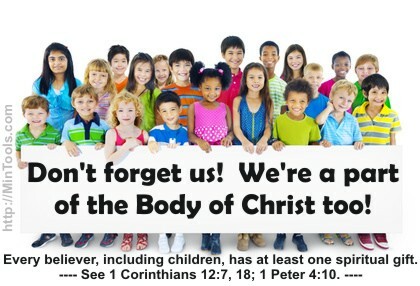 The last thing we want to do is grow kids who are self-sufficient and self-reliant in their Christian walks. We do not want them to start their life of service learning to do it in the flesh. Both their motivations and means of serving need to be an outgrowth of abiding in Christ who said "apart from Me you can do nothing." Your Gifts for Children: Kid-Friendly Spiritual Gifts Adventure by Church Growth's Team Ministry is an easy to use tool to introduce children to spiritual gifts. It includes "11 coloring pages featuring biblical examples of each spiritual gift based upon people in the Bible and a brief spiritual gifts survey created for children, for a total of 16-pages."